Breastfeeding in public is protected by law and is 100% okay. Baby should eat whenever he gets hungry, no matter where mom is. A special bond occurs when a mom is breastfeeding her baby. Breastfeeding is for anytime, anyplace. Although the idea of sharing these moments in public may cause anxiety, moms should know that it is their legal right to breastfeed anywhere they are allowed to be. Breastfeeding in public can be done with confidence—most moms are already nursing in public and going completely unnoticed. It has never been easier or more accepted to breastfeed in public. With some practice, you'll soon be a pro. Though it's easy to nurse discreetly in most clothes, you may be more comfortable wearing a specialized nursing top that is designed to keep you covered when in public. No matter what you wear, remember that there is no shame in feeding a hungry baby. Feeding your baby when he or she is relaxed will help begin the feeding with ease—waiting until your baby begins to cry may cause stress or attract unwanted attention. Wear comfortable clothing, such as layered shirts, that can easily adjust while nursing. Find the most relaxing position for you and your baby. Consider practicing at home in front of a mirror. Nurse your baby right before you leave. Pack a baby blanket to place over your shoulder or carry your baby in a sling, in case you want extra privacy while you breastfeed. Look for a comfortable place where you can nurse when you arrive. This allows you to be ready when your baby is hungry. Many stores have areas designated for moms and babies that provide a quiet place to sit, as well as, a diaper-changing table. Some places, like food courts and in-store restaurants, offer open seating. Be confident when nursing in public. Know that you are doing the best thing for your baby. When talking to people while nursing, keep eye contact with them so they will know it is all right for them to look at you. 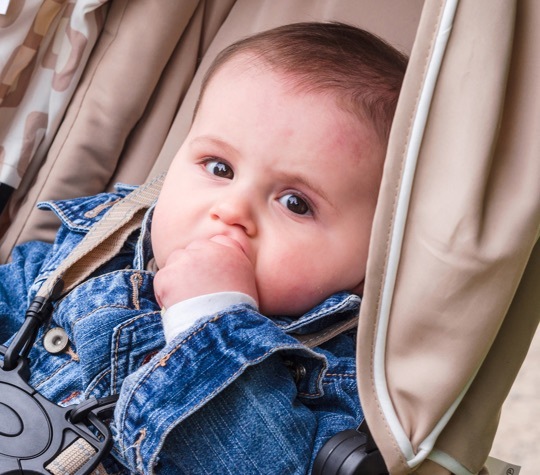 If you are by yourself in a large open area, focus on your baby's eyes and face. After a while, you won't even know there are others around you and they will be less likely to notice you. Texas law protects your right to breastfeed in public. Your local WIC office can provide you with a pocket-sized card that explains this law. You can also download a card explaining the law here. Use it to educate others about the right to breastfeed in public. Texas and federal law recognize that breastfeeding is good for mom, baby, and society. 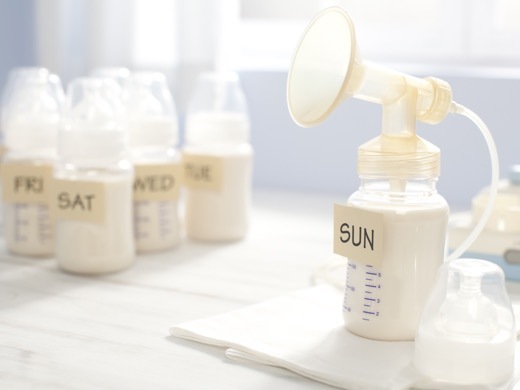 Help your baby learn to take a bottle of breastmilk.